Late last night high winds and the disappearance of the stars signaled the onset of a cold front that was predicted yesterday by high cirrus clouds streaking across the Uinta sky. This morning it is 40 degrees (*F) and raining, and we are engulfed in the clouds here at Margie Lake. During a break in the storm, I got up and fished, catching several Margie brookies until the rain came again. I retrieved the Ursacks, brought them to my mates, and we cooked and ate breakfast in our shelters. The rain came down harder so we hunkered down for the morning. Under my tarp, I repaired Dan’s Thermarest pad, which had a glue-dot repair that I did on another trip with him several years ago. It seems that the glue dot failed, resulting in severe bubbling of the overpatch. I ripped the old patch and dot off, cleaned the wound, and used Loon UV Wader Repair to seal the tear. Not having any sunlight to cure the glue, I used the nifty Loon UV pen light to do the job. On top of this went the Thermarest glue-dot-and-overpatch kit. I wonder if this repair will last for another several years? Suffice it to say that a big fan of the Loon UV glue and UV pen! Another break in the storm came at noon so we decided to make a run for Rocky Sea Pass so we could cross the divide into Four Lakes Basin. A beautiful trek past Uinta Lake led us to a cairned route past the Uinta Lake buttress through more tundra, talus, and bogs to the vast basin below Rocky Sea Pass. By now the temperature had dropped and the rain became more severe. We only briefly contemplated camping below the pass but instead decided to go for it. The climb to the pass went without drama but we were wet and cold by the time we reached the top. We did our best to stay hydrated, nourished, and moving, and the drop in elevation on the west side of the pass into the trees was a welcome reprieve from the cold at higher altitudes. We met a goat-packing party camped at Pigeon Milk Spring and tried to infer where the name came from. It’s a strange little spring with the milky glacial color of something in the Olympic Range but ran warm enough to support a vibrant growth of bright green water plants at its source. Giving up on trying to understand the naming convention, we then had a cursory discussion about how to milk a pigeon. We then stopped at the junction of the Four Lakes Basin And Highline trails and took a break from the rain under the canopy of a big spruce. I made my usual midday lunch which consisted of Seabear smoked salmon with cream cheese spread on pilot biscuits. We had our sights set on Dean Lake so we headed up the hill to 4LB and veered off trail at Jean Lake. We are camped in the beautiful meadows on the east shore of Dean Lake, all alone. We cooked under the shelter of a large spruce which provided a welcome awning for a meal of pizzadillas fried in the Fry-Bake. Hot fried food tasted especially good tonight and boosted morale. We have a big, hot campfire to warm up and dry our trekking clothes, and we stayed up late telling stories, laughing, and warming up. The cold and wet trek took its toll on us today and are a bit relieved that the rain has let up some. Maybe we have a promise for some blue sky tomorrow as we spend the day exploring this basin to see what sort of fish inhabit these lakes. 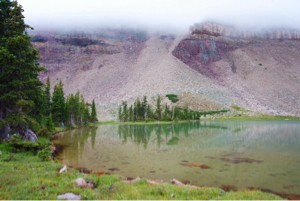 // Follow our trek in the High Uinta Wilderness! Enjoy live dispatches and photos via satellite from this expedition online at http://www.ryanjordan.com/uintas2014 and receive updates from Twitter via @bigskyry (http://www.twitter.com/bigskyry).